with the slow decay of film it is getting harder and harder to find film to use on old (or new) cameras that use 120 film. Even you do find 120 film (hint Amazon, eBay) it is not trivial to develop (not to mention expensive). But what if you have a Diana or a treasured Mamiya that you want to use? 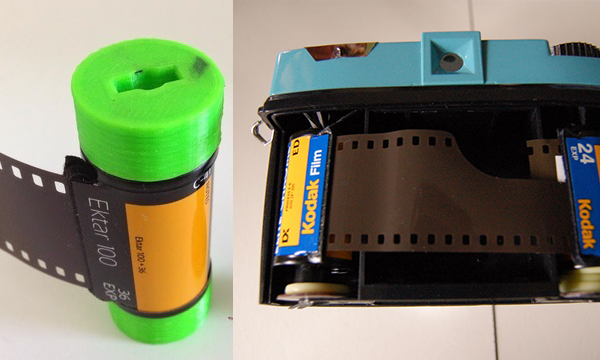 You can still use them with 35mm film if you can manage to load the film into the spool in a way that you can wind it after each shot. The photos you take will not be restricted to the 35mm frame that you are accustomed to, but go all over the sprockets. It’s a pretty cool effect if you ask me. There are plenty of adapter plans out there, we like this one. (It is by Clint O’Connor, the same guy who made the 3d printed pinhole we shared way back). The adapter is pretty straight forward both to print and to use. It is build of two spacers that go above and below the 35mm can, into the place where the 120 spool used to be. You can get the files here. With this method, shared by Instructable user nseabright you don’t really need to get anything at all. All you need is an old 120 spool of a Diana or another camera and the guts to cut and saw it. Interestedly, the slit in the 120 spool that is used to hold the film, is a perfect fit with the top and bottom of a 35mm canister. By cutting out the middle of the spool and using some buttons as spacers, you can use your 25mm can directly. You can read more about this method here. If you just want it quite and dirty, Paul Murphy has a great solution for you. Foam and rubber bands. The foam on the 35mm can keeps it in place, while the rubber bands made sure the film is spooled correctly. If you are using a mechanism that allows to spool back, remember to do that before opening the chamber. When the camera is loaded with 35mm film you have to pull slightly less per photo that what it takes with 120 film. Now go and shoot some film. I did method #2 for my RB last year. Sprocket holes are cool in some instances. I have not yet had a problem finding 120 film. The problem isn’t finding it, it’s getting it processed. It costs me something like $3.00 per frame to get 120 processed locally. I encourage anyone interested in film to give home processing a try. Processing film is no harder than baking brownies. Follow the directions exactly and you will be fine. The investment is minimal and it can be easily done in any bathroom that can be made dark. Pick up a cheap scanner and you have a nice hybrid, analog / digital process. I have even processed color film at home in my bathroom. There is simply nothing like medium format film! You can get a spool to hack up by buying 120 film for about 5 bucks and pulling the film off. But then, why not shoot it first if you have the gear? Can you send this 35mm film off to be processed like any other 35mm roll or does it need special instructions for the developing?